* Bernina Credit Card, Fixed Payment No Interest Financing with approved credit! The Bernina E16B is the perfect partner for your home studio or business with 16 needles, speed of up to 1,400 spm (stitches per minute), automatic tension settings and a narrow cylindrical arm for sleeves and other tight spaces. Complete tasks like a pro with the BERNINA E 16, whether embroidering a baseball cap, small patch, big shopping bags or jacket backs. Additional power provides enhanced overall performance. Scalable multi-head system that leaves standard multi-head machines in the dust - up to 50% more productive! Progressive speed changes combine with needle case & pantograph refinements make BERNINA E 16 more efficient than previous models. Fewer bobbin changes mean reducing downtime per machine, increasing production efficiency exponentially. Embroidery has never looked better on popular products like stretchy fabrics, performance wear or dri-fit shirts, hats caps and more. 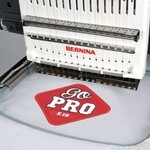 The BERNINA E 16 is capable of loading the largest embroidery designs. Imagine a scalable embroidery system that allows you/your business to your embroidery production as-needed. The BERNINA E 16 grows with YOU! This modular embroidery system is simply better than a standard multi-head embroidery machine, because you can add single-heads to the system at any time. You also have the freedom to configure your embroidery machines to match your production needs. 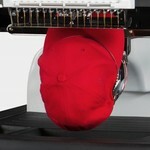 Even when in multi-head configurations, individual heads can be setup for embroidering on different products. FOR EXAMPLE: you may have three heads running baseball caps and one running a polo shirt. Embroidery postitioning is easy & accurate with Laser Alignment. The BERNINA E 16 delivers the precise amount of thread needed at any given time, resulting in the highest quality stitching at the fastest speeds possible. Embroidery on socks, shirt pockets, golf club covers and other tight spaces is possible due to the small size of the lower arm on the BERNINA E 16. With 16 needles, speeds of up to 1,400 stitches per minute (spm), automatic tension settings, and a narrow cylindrical arm—the BERNINA E 16 will complete the task like a pro—whether embroidering a jacket back or small pocket. Our cutting-edge machines are equipped with numerous innovative functions and programs. Here, we provide you with an overview of what your preferred machine is capable of, and tell you all about the advantages of the BERNINA E 16. Cap hoops and driver	opt. Specialty frames and hoops	opt. Three sizes of pocket frames	opt. Compatible with BERNINA Embroidery Software 7	opt. 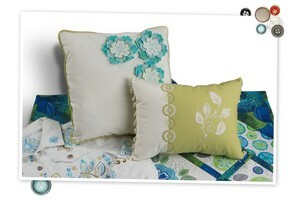 Compatible with BERNINA Exclusive Design Collections	opt. Please read the release notes carefully. Installation and First Time Start Up Instruction. 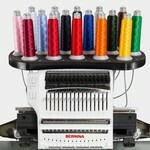 Introducing the BERNINA E 16 multi-needle embroidery machine. Meet the new BERNINA E 16, our 16 needle professional quality embroidery machine! Faster, more professional and larger embroidery than ever before! Perfect for home, studio or commercial use. Join us and see the amazing features of the BERNINA E 16. With 16 needles, speeds of up to 1,400 stitches per minute (spm), automatic tension settings, and a narrow cylindrical arm—the BERNINA E 16 will complete the task like a pro—whether embroidering a jacket back or small pocket. Personalize team uniforms and caps, monogram stylish totes, commemorate a special occasion, use the Chenille technique for a special 3-D effect, or complete an elaborate embroidered quilt—the results will be everything you ever dreamed of. BERNINA International AG warrants this Product for a period of twenty (20) years against defective materials and/or workmanship, five (5) years on ciruit boards, and two (2) years electrical parts. 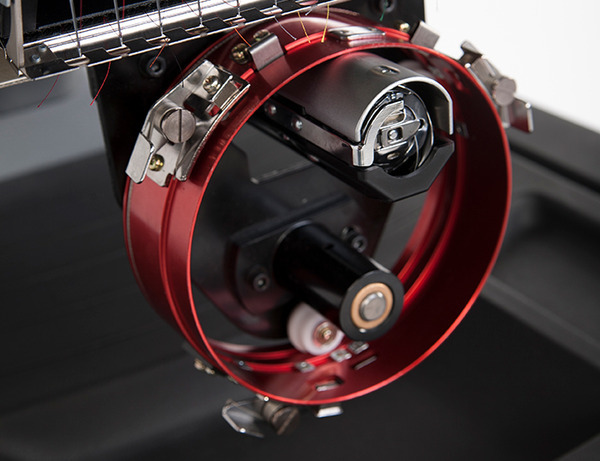 Go Pro Tension System: This unique system ensures threads are fed smoothly and with automatic tension adjustments, for the same perfect quality on every sew-out. Embroider confidently, knowing each stitch-out will be as beautiful as you envision. Extra large embroidery field 400 x 350mm. From jacket backs to embroidered quilt blocks, your BERNINA E 16 will handle large projects with ease. Laser Alignment: The ultraprecise laser registration assures accurate design placement. BERNINA E 16: Make it Personal – Keep it Professional. With 16 needles, speeds of up to 1,400 stitches per minute (spm), automatic tension settings, and a narrow cylindrical arm—the BERNINA E 16 will complete the task like a pro—whether embroidering a jacket back or small pocket. Personalize team uniforms and caps, monogram stylish totes, commemorate a special occasion, use the Chenille technique for a special 3-D effect, or complete an elaborate embroidered quilt—the results will be everything you ever dreamed of. BERNINA Rotary Hook: Speed, precision, and a high-performance thread trimmer are the benefits of the BERNINA rotary hook system. Compatible with convenient pre-wound bobbins for even more time saving. 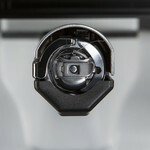 Industry’s smallest cylindrical lower arm: Your BERNINA E 16 handles all of your embroidery needs, large and small. Slide baby items, T-shirts, pockets, or tote bags easily over the narrow arm, eliminating the need to open seams or deconstruct the item prior to embroidering. 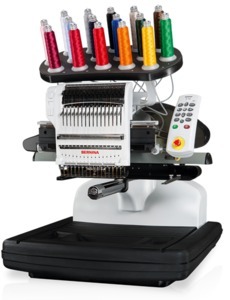 Optional Cap Equipment: High-speed embroidery with 16 needles: Complete more embroidery more quickly by eliminating the time spent re-threading for each color change. Less time spent managing the embroidery process means more time for creativity and more custom jobs completed. Complete more embroidery projects confidently and more successfully with 1,400 spm and the quality of a true commercial system. 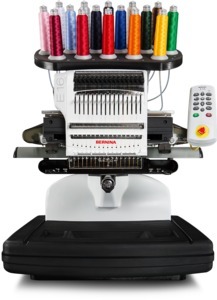 Optional: There are dozens of popular hat styles, Bernina E16 embroidery machines can handle them all! Simply remove the hoop arms, install the cap driver, hoop your hat using our supplied frame, and go to work. Embroidery dreams become reality. With roots in the industrial world, BERNINA is excited to share with you the dream of faster, more professional and larger embroidery than ever before. The dream of 16-needle embroidery suitable for home, studio, or commercial use is now a reality. Whether you’re new to machine embroidery or more experienced, you will appreciate the thought behind the details. 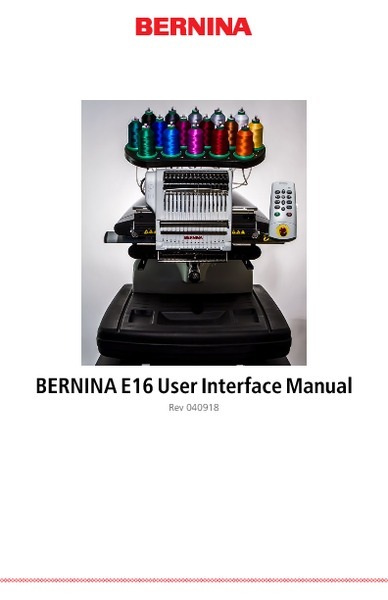 WHAT CAN YOU EMBROIDER WITH BERNINA E 16? Bring your imagination to life! Polo Shirts, Backpacks, Hats and caps, Tote Bags, Beanies, Duffel Bags, Hoodies, Shoes, Quilts, Blankets, Towels, Monograms, Letterman Jackets, Jeans, Leather, Patches, Carhartt Jackets, And Much More.! The Go Pro System. Your BERNINA E 16 includes an assortment of standard accessories and time-saving features, providing a massive amount of value for this package. When your growing business or creativity is ready for more, the Go Pro system has you covered. With the optional cap driver & wide frame, customizing ball caps is a breeze like never before - whether you need to make one, or twenty! 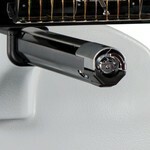 The narrow cylindrical arm combines with the unique pocket frames for perfect stitching in confined spaces. You will discover unlimited embroidery possibilities with the addition of the optional BERNINA Embroidery Software 7. Create custom monograms, edit existing designs or digitize your own creations. OPTIONAL ACCESSORIES: Specialty frames and hoops, Three sizes of pocket frames, Compatible with BERNINA Embroidery Software 8, Compatible with BERNINA Exclusive Design Collections, Cap Driver, 2 Cap Frames, Gauge, 3.0" x 3.75" Pocket Hoop.